Advent is the season of the year leading up to Christmas. It is observed with various traditions and rituals by Catholics and other liturgical groups such as Lutherans, Anglicans, and Methodists. In recent years, Advent celebrations of one type or another have been added to many evangelical services as well. The word advent itself means “arrival” or “an appearing or coming into place.” Christians often speak of Christ’s “first advent” and “second advent”; that is, His first and second comings to earth. His first advent would be the Incarnation—Christmastime. The Advent season lasts for four Sundays. It begins on the fourth Sunday before Christmas, or the nearest Sunday to November 30. Advent ends on Christmas Eve and thus is not considered part of the Christmas season. The Advent celebration is both a commemoration of Christ’s first coming and an anticipation of His second coming. As Israel longed for their Messiah to come, so Christians long for their Savior to come again. The Eastern Orthodox Church does not observe Advent per se, but they do keep a long fast before Christmas. In the West, Advent has developed a more festive tone, although many churches also keep a fast and focus on prayer and penitence akin to what takes place during the Lenten season (sometimes, Advent is even called “Little Lent”). Advent is seen as a time to prepare one’s heart for Christmas and for the eventual return of Christ (and the judgment He will bring to the world). On e of the most common Advent traditions involves the use of evergreen wreaths, branches, and trees. On the first Sunday of Advent, churches and homes are decorated with green to symbolize the eternal life that Jesus brings. 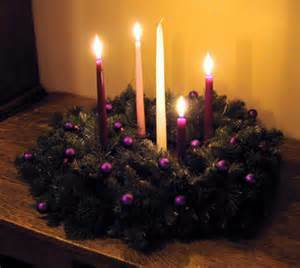 An Advent wreath—an evergreen circle with four colored candles surrounding a white one in the middle—is placed in a prominent spot. The candles are then lighted one at a time, on successive Sundays. The first candle is the candle of “hope” or “expectation.” The three remaining candles on the perimeter are given various meanings depending on the church. On Christmas Eve or Christmas Day, the center white candle is lighted; this is the “Christ Candle,” a reminder that Jesus, the Light of the Word, has come. There is certainly nothing wrong with commemorating Jesus’ birth and anticipating His return—such commemoration and anticipation should be an everyday part of our lives. Are Christians required to observe Advent? No. Does observing Advent make one a better Christian or more acceptable to God? No. Can celebrating Advent be a good reminder of what the season is truly all about? Yes, and therein lies its greatest value.